Denna produkt ger dig 676 bonuspoäng. Självavlossande vagn OOtz 44 Erz 611 112 typ DB, längd över buffertar 11,5 cm, epok III. German Federal Railroad (DB) type OOt Saarbrücken and OOtz 44 Erz Id four-axle hopper cars. Version with very low upper superstructure and brakeman's platform. Some of the cars still lettered for the Brit.-US-Zone. Used to transport iron ore. Standard design pressed sheet metal trucks with welded underframes as reinforcement. The cars look as they did around 1952. Model: The hopper cars have detailed construction with different car numbers. All of the cars have brakeman's platforms and end locking wheels. 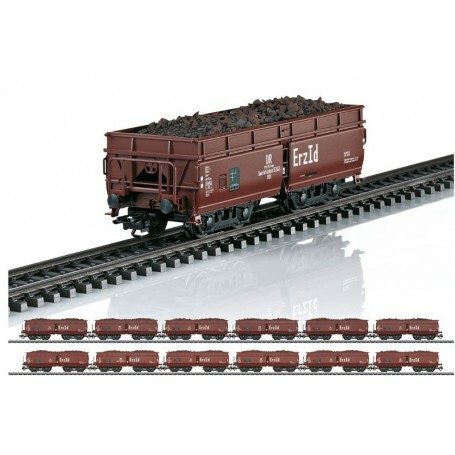 The hopper cars have load inserts for freight loads consisting of scale-sized real iron ore. All of the cars are individually packaged. Length over the buffers per car 11.5 cm / 4-1/2'. DC wheel set per car E700580. New tooling for the Erz Id hopper car. Loaded with real iron ore.